It’s been a record-breaking ski season here in Mountain Village. And Telluride Ski Resort is going out with a bang with a number of fun events on Sunday to mark the closing day of the ski area on April 7. The festivities kick off with the pond skim at Gorrono Ranch. If you’re not familiar with pond skims, check out this great article from the Colorado Sun on this unique spring skiing tradition. Registration for the skim begins at 10 a.m. The first 100 people to register will be accepted. The pond skim competition will run from 12 p.m.-2 p.m. with DJ Soul Atomic spinning tunes. Gorrono will have drink specials from Titos Vodka, Rodney Strong Vineyards, Telluride Brewing and Sweetwater Brewing. 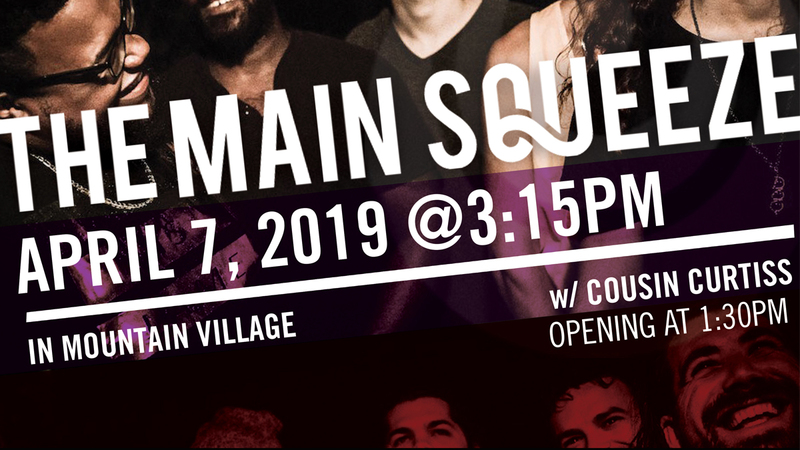 Last call for alcohol at Gorrono will be at 2:45 p.m. and Gorrono will close for the season at 3 p.m.
Down in Heritage Plaza, Cousin Curtiss will kick off the free end-of-season concert at 1:30 p.m. Funk/rock band the Main Squeeze will take the stage at 3:15 p.m. They’ll play until 4:45 p.m.
Down in Telluride, local rockers Joint Point will play their 10th annual end-of-season party at the base of Lift 8. Music starts at 4:30 p.m.